Kyle just told me that he wanted to be a caveman when he grows up. I started to tell him that it wasn't a profession, but stopped myself. Because when I imagined what it might be like if he actually grew up to be a caveman, I realized it could be pretty cool. When Christina and I are retired and want to go camping we could go visit Kyle and he could make fires and hunt for us and stuff. People would ask me, "Hey Ian, what do your kids do?". And I could say, "My daughter is a patent attorney in Palo Alto, and my son, well... he's a caveman. He lives in Carlsbad". Christina: Joelle, do you have to go poo-poo or pee-pee? Joelle: Um neither. I have to slime. The hotel that we ate lunch at yesterday had an area with some caged birds and rabbits, so I took Joelle to go and visit them. As we approached, a parrot said "Hello!". Joelle had never heard this before and it really threw her. She turned to me and said, "Daddy, that bird just talked to me." - as if to confirm that it actually DID just happen. So I replied, "Yes, they can talk". A look of wonderment and joy flooded her face. Giddy with excitement, she immediately turned around and yelled "HELLO RABBIT!" into the rabbit's cage. Apparently, she thought I meant that ALL the animals there could talk. She was a little disappointed when I explained to her what was going on. For a second there, she must have thought she was Dr. Dolittle. Kyle: DAD! 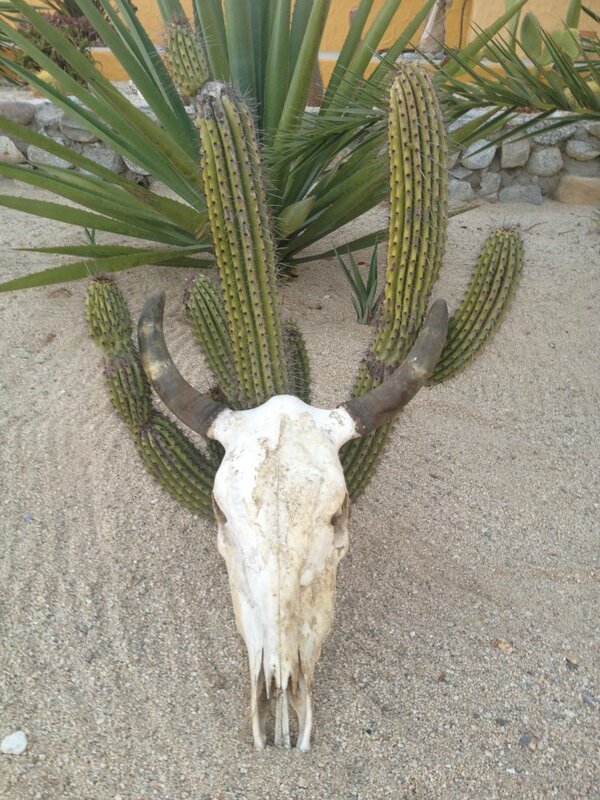 DON'T GO NEAR THAT CACTUS! Kyle: It's DEADLY! Look, it already killed a bull!